If you have been diagnosed with Graves' Disease, want to avoid taking medication if at all possible, and don't even want to consider treating your condition with radioactive iodine, then the information you're about to read can be life changing. 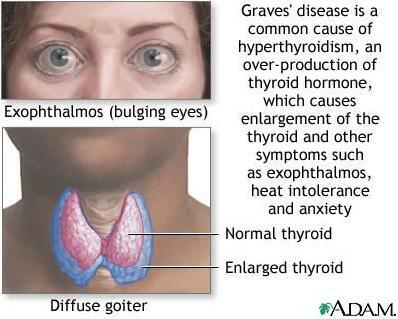 I am a licensed healthcare professional and was personally diagnosed with Graves' Disease. Knowing that this is a serious autoimmune thyroid condition, I honestly wasn't sure if I would rely on natural treatment methods, even though I without question have a natural mindset. The problem is that Graves' Disease can be life threatening if the symptoms are not controlled, and as a result, I didn't take my high pulse rate and palpitations lightly. I did consider receiving a combination of the conventional medical treatments and the natural treatment protocol, which I do recommend for some patients. But although my pulse rate was much higher than normal (in the mid 90's, when it was usually in the mid 60's), I didn't consider it to be too extreme, and thus decided to go strictly with a natural treatment protocol and not take any prescription medication (the endocrinologist I consulted with recommended Methimazole and a beta blocker). As for radioactive iodine, this is something I planned to avoid at all costs. In my opinion, this harsh treatment method should be used only as a last resort, as most people who "choose" this treatment method will become hypothyroid. Even when someone with Graves' Disease has an extremely high pulse rate (for example, greater than 120 beats per minute), radioactive iodine usually isn't needed to control the symptoms, as taking a beta blocker will usually accomplish this. Of course there are exceptions to this rule, and there are some circumstances where taking radioactive iodine is necessary. It's truly amazing how many different conditions people try to treat naturally on their own. They simply do some research on the internet, find out what nutritional supplements and/or herbs might be able to help, and visit their local health food store and purchase these supplements. For some conditions this isn't a problem, but for a serious autoimmune condition such as Graves' Disease, this is definitely not recommended. You should either be under the care of an endocrinologist, a competent natural doctor, or in some cases, both types of healthcare professionals. As for whether you should take the prescribed medication, which usually consists of a drug like Methimazole, and/or a beta blocker, such as Propranolol, this obviously is something that only you can decide. Obviously an endocrinologist or general practitioner that prescribes these drugs will think that a conventional protocol is the best option, which in some cases it might be. On the other hand, a holistic doctor will often think that a natural treatment protocol will be the best option for treating this condition. Your best bet is to speak with both types of healthcare professionals, gather as much information as you can, and then make an informed decision on your own. While I'm not at all opposed to a patient taking the prescription drugs, what they do need to keep in mind is that these medications are not getting to the underlying cause of the disorder. So while taking them in the short term to manage the symptoms might not be a bad idea, you also need to consider the potential consequences of taking these drugs for a long period of time. I personally can't tell a patient to stop taking the drugs, but if I was in a situation where I had extreme symptoms, I would have probably taken the beta blocker to control the symptoms for a month or two (mainly the high pulse rate and palpitations), along with following the natural treatment protocol, and then would have weaned myself off the medication and evaluate my symptoms. Because the fact remains that there are natural remedies that will help control the symptoms while you are trying to restore your overall health. For example, one of the herbal remedies I took that helped with my symptoms was Bugleweed, which is for people with hyperthyroidism. Motherwort is another herbal remedy that can help with the symptoms of Graves' Disease. Now once again, I'm not suggesting that anyone with a high pulse rate and palpitations replace their medication with these herbal remedies. Although these herbal remedies are powerful, everybody's condition is different, which is why you really should consult with a competent healthcare professional. While Graves' Disease is often labeled as being a "thyroid disorder", one can't forget that the immune system is affected, and it is therefore important to address the immune system component. In fact, one can argue that the immune system component should be addressed before focusing on the thyroid gland. And in some cases, strengthening the immune system alone can restore someone's health back to normal. Echinacea and Selenium can help strengthen the immune system. When I began my natural treatment protocol I also took a product called Rehmannia Complex, which is a product from the nutritional company Standard Process. The adrenal glands are usually affected too, and therefore should also be evaluated. Since most medical doctors don't properly evaluate the adrenals (and most won't attempt to evaluate this area at all), I ordered an Adrenal Stress Index test for myself, which is a saliva-based test that measures the cortisol levels at different times of the day. Initially when I was diagnosed with Graves' Disease, I had low cortisol levels in the morning and early afternoon. But the natural treatment protocol helped bring my cortisol levels back to normal. Some supplements I took to help with the adrenals included an adrenal support formula (also manufactured by Standard Process), as well as Eleuthero. Of course the quality of the supplements used are important. You need to be careful, as while there are some great nutritional supplement companies out there, many companies produce low quality products. Even some of those sold in health food stores aren't of the highest quality. I have tried products from many different companies, and some of the best products I have used on myself and on patients are produced by a company called Standard Process, as they have been producing quality supplements for many years. The only bad news is that you can't purchase these supplements from a health food store, as they are only distributed by healthcare professionals. I don't want to give you the impression that taking nutritional supplements and herbal remedies alone will be enough to restore your health back to normal. There are actually five main factors to help aid the recovery process for someone that has an autoimmune thyroid disorder. These include 1) having a good attitude, 2) proper nutrition, 3) getting ample sleep, 4) regular exercise, and 5) doing a good job of managing stress. All of these are important if you want to use natural treatment methods to restore the function of your thyroid gland back to normal, assuming this is possible. While I have spoken about symptoms such as having a high pulse rate and palpitations, there are of course other symptoms that are common with Graves' Disease. In addition to the high pulse rate and palpitations, I personally experienced weight loss, increased appetite, and shakiness. Upon beginning the natural treatment protocol it wasn't too long before I noticed my pulse rate and the palpitations decreasing, as well as the shakiness. In fact, I remember clearly that when it was first suspected that I had a thyroid disorder and a had blood drawn, when I held my arm out for the nurse my arm was noticeably shaking. But once again, this was one of the first symptoms to go away when I began the natural treatment protocol. The last symptom to disappear was the increased appetite, as after a few months I had a regular pulse rate, no palpitations or shakiness, and was gaining weight. But I still had a voracious appetite. But eventually this symptom disappeared too, and along with not having any more symptoms, it was of course great to see the blood tests confirm that I no longer was hyperthyroid. As for whether natural treatment methods can help with your autoimmune thyroid disorder, just keep in mind that everyone is different, which of course means that not everyone will be an ideal candidate to receive these treatment methods. Some people will need to take medicine, while others will benefit from a combination of both conventional and natural treatment protocols. I will conclude this article by suggesting that anyone that has been diagnosed with Graves' Disease at least consider speaking with a competent natural doctor, especially before you consider getting treated with radioactive iodine. But even if your endocrinologist or general practitioner is conservative like mine was and recommends Methimazole and a beta blocker, keep in mind that these prescription drugs won't do anything to restore your health back to normal. So while they might do a great job of controlling the symptoms, they will usually leave the immune system in a weakened state, leaving you more susceptible to other autoimmune conditions in the future. And just remember that consulting with a natural doctor doesn't mean you will be forced to choose a natural treatment protocol, but will simply give you more valuable information to help you make an informed decision, so you won't have any regrets in the future.